I didn’t want to feature another dessert, but it was just impossible due the circumstances and to the encounter with an amazing citrus. I found the wonderful bergamot at my favorite store, which I never thought it was possible to find in the US. I am infatuated by bergamot scent and deeply in love with it. I just want to bathe in its scent and rub its peel all over my body. Bergamot is quite famous in Nancy, my hometown… bergamot candies made with bergamot oil are a symbol of the city and the recipe is impossible to find, it’s somehow kept secrets among local “confiseurs” (specialists in making confiserie which include candies or any specialties made out of fruits, sugar or any sweet ingredient). They also make bergamot soaps that smell ridiculously good, you just want to eat them. Bergamot scent is a pure delight, but very few eatable products contain that flavor, only Earl Grey tea, and some bergamot jam you can find locally in Nancy. 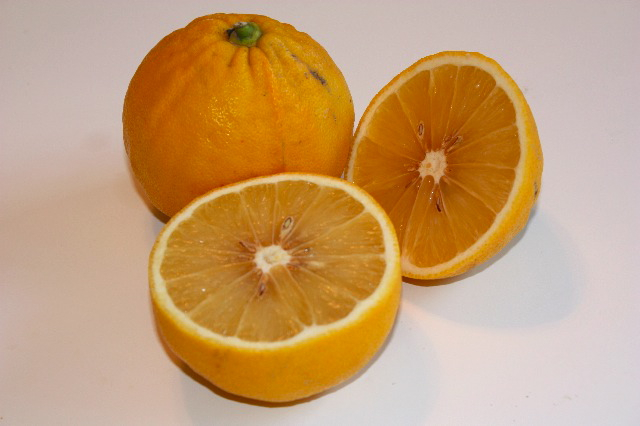 Bergamot is mainly used in perfumes, scents, essential oils, for healing purposes, etc.. and I am wondering why its use in cooking is not that popular, since its a citrus that looks like a big lemon with a smell and flavor that is pure delight. I know in some Moroccan dishes they used preserved bergamot instead of lemons, but that’s the extend of its use in the culinary world. It ‘s very easy to get addicted to bergamot once you taste it, so be careful to not sink into it and turn into a bergamot junkie, like I am. These tarts are superb, flavorful, citrusy, a tiny tarts and slightly bitter but so “parfumées” it’s like eating your favorite perfume in a mouthful. Imagine your eating your favorite Chanel or Dior perfumes…Besides, there’s little sugar, so they’re very light. I used a standard mixed flour crust whose recipe you can find here. You have to try bergamot, but the side effects are dangerous, you might develop a strong addiction to it. For the crust follow recipe. In a mixing bowl, mix apples slices with juice of one bergamot and zest. Add sugar. Mix well and let it infuse for about 2-30 minutes. Roll crust and cut in about 10 cm diameter circles. Remove slices from bowl, drain and kee the juice. Set the juice aside. 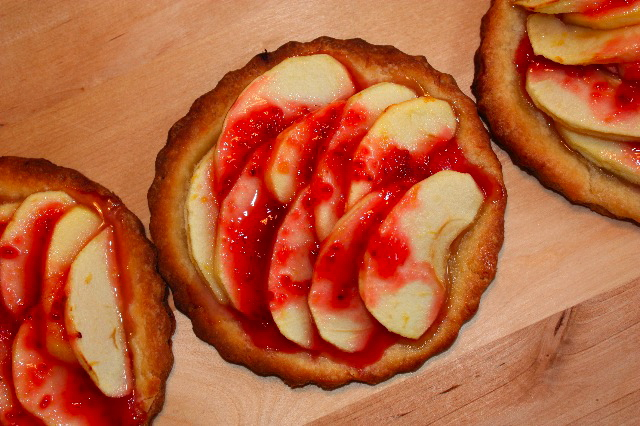 Place apples slices on the dough circles. Cook in a pre-heated oven at 370F for about 30 minutes or until the bottom is golden brown. Remove from the oven and let it cool but keep lukewarm. Add raspberry jam to the bergamot juice you saved. Mix well to obtain a smooth mixture. Place one tsp of raspberry/bergamot mixture on top of the apples. Serve lukewarm. This entry was posted by silvia on March 10, 2010 at 9:56 am, and is filed under Desserts. Follow any responses to this post through RSS 2.0.You can leave a response or trackback from your own site. I am so Jealous! I used to grow bergamot. I love the smell more than anything. I can just taste your dessert. I WANT some!!!!! I have not tried Bergamot before. Not sure if they have it here? It does smell incredible. I am afraid to eat it, and if I were to try it preserved like lemons all bets would be off! These tarts are very cute and appealing. Hmm…mm… so adorable! 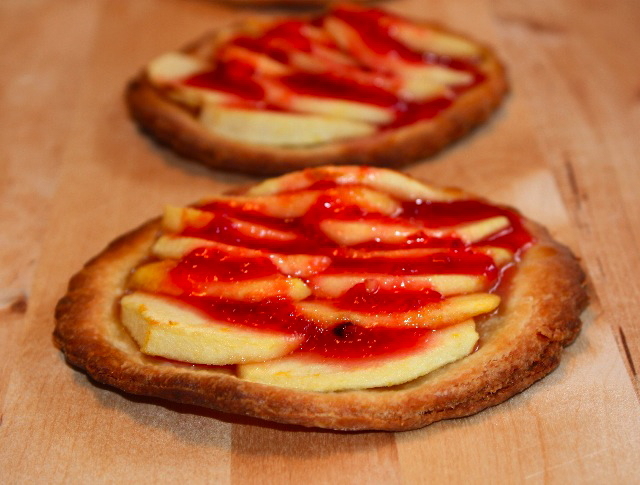 I must start making this kind mini size tarts too! Just the right bite size. Love it! I only know bergamot from Earl Grey tea, not as a pastry ingredient. But it sounds wonderful in your tarts. We’ll be on the look-out here in Houston. I finally got around to ordering a yogurt maker after being inspired by your yogurt articles — just a modest one from Amazon — and I think your flavors would probably make a great yogurt too. Ces tartes me semblent terribles ! Je les essaierai vite !